Five major groups were formed following bloodtyping. Dr Sponenberg identified renowned horse breeders that were expected to continue the line of the Wilbur-Cruce horse. The largest group went to California, one group to New Mexico, two groups to Oklahoma, and one to central Arizona. None remained near the ranch in southern Arizona. It was more important at that time to find breeders who were truly dedicated to preserving the herd than to keep the horses in their original environment (southern Arizona). The New Mexico group was in an environment similar to that of the Wilbur-Cruce Ranch. 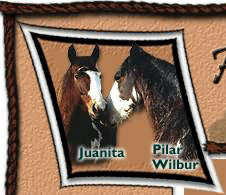 I read an article on the Wilbur-Cruce horse in March of 1997, written by Janie Dobrott and Jean Walsh, published in the American Livestock Breeds Conservancy newsletter. In this article the need for breeders, especially in southwestern United States was stressed. Botanist Richard Felger and myself went to see the first group in New Mexico. It was decided to start a small breeding program at our small ranchito northwest of Tucson with the goal of promoting the Wilbur-Cruce horse and to encourage other breeders to start programs. This program was successful. The Dragoon Mountain Ranch, not far from the original Wilbur-Cruce ranch, started a program in 1988 with eight mares and one stallion. The size of the ranch allows the horses to be in a natural setting. Those horses are some of the original foundation mares and stallions. The group was on lease. Foals from that breeding group and unrelated Wilbur-Cruce stallions now form the Dragoon Mountain Ranch breeding group. We now have breeding groups in Arizona, New Mexico, California, Nebraska and Colorado as of 2009. 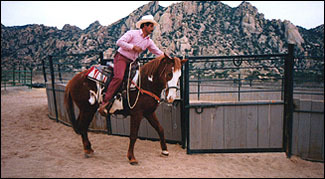 Heritage Breeds Southwest relocated their breeding program from Tucson, Arizona, to Silver City, New Mexico, in June of 2007.